What happens when a successful, determined middle-aged man falls in love with a woman who has been happily married for twenty-seven years? If he’s Avery Laird, he hires her to work for him. Buddy Middleton is positive that the job his wife, Ginger, is offered is too good to be true, that Avery Laird has an ulterior motive, but he can’t prove it. When Buddy voices his doubts and urges her not to take it, he makes Ginger feel as though she isn’t worth the offer. Determined to prove him wrong, Ginger goes to work for Laird and saves him over half a million dollars in the first real estate deal she handles for his company. Flush with success, Ginger believes that the problems she and Buddy had are over. But then they have an unexpected guest from the past, a fellow named Hoot with whom Buddy played professional baseball when they were newly married. Hoot tells Ginger the true reason Buddy quit baseball, a subject they had always avoided. When Ginger confronts Buddy with what she has learned, trouble really begins… and Avery is there waiting. 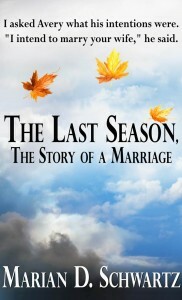 The spark for The Last Season, The Story of a Marriage came from a sudden image I had of three middle-aged adults sitting at a dinner table, a married couple and a single man. The husband asked the man what his intentions were, and the man replied, “I intend to marry your wife.” I had to run with it! I thought about the story I wanted to tell. I wanted the couple to have a long-time happy marriage, but a marriage that had a wound which had never healed, a wound that had been buried for years. And I wanted the man who was pursuing the wife to be attractive, successful, and determined to have her. Although Henri’s was elegant and the lobster bisque was superb, I didn’t relax until the main course. My salmon was too good not to enjoy. Avery was aware of my uneasiness. I think it might have amused him. “Are you always so conscious of everyone who walks into a restaurant?” he said when I looked at two couples being seated across the room. “I wouldn’t call this salmon work,” I said. I was born and raised in Buffalo, New York. Reading was my escape from the legendary Buffalo winters and probably contributed to my becoming a writer. I like strong characters and strong stories. My goal is to always give the reader a reason to turn the page.